Upon notification of a nominee’s confirmation, the President performs the next step in the appointment process—the signing of the nominee’s commission. The commission is a formal document empowering the nominee to assume the judicial office, which the President must sign before the nominee may begin his or her new duties. The date of a nominee’s commission is the date the President signs it, which usually occurs within a few days of Senate confirmation (but can also occur on the same date as the confirmation itself). The commission is transmitted to the Department of Justice, which then sends it, as well as a packet of other documents, to the nominee. This process—receipt of the packet from the Department of Justice, administering the oath of office to the nominee, including obtaining his or her signature on the commission—typically occurs within a week or two of Senate confirmation. In some cases, however, a nominee might wait longer, for professional reasons, to take the oath and sign his or her commission. For example, a law professor who is confirmed as a U.S. district court judge might wait to sign her commission until after she has finished teaching for the semester. Typically, the last step in the appointment process is the investiture. At this ceremonial event, attended by family and friends, the new judge is sworn in yet again, in the courtroom. The ceremony, however, is not required for the nominee to assume office and can take place weeks or months after the oath of office is executed. 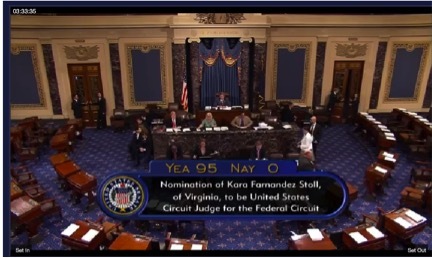 According to C-Span (Link), Kara Stoll was confirmed today by the US Senate to be the newest member of the United States Court of Appeals for the Federal Circuit. Ninety-five members of the Senate voted “yea” and five did not vote. You are currently browsing the 717 Madison Place blog archives for July, 2015.